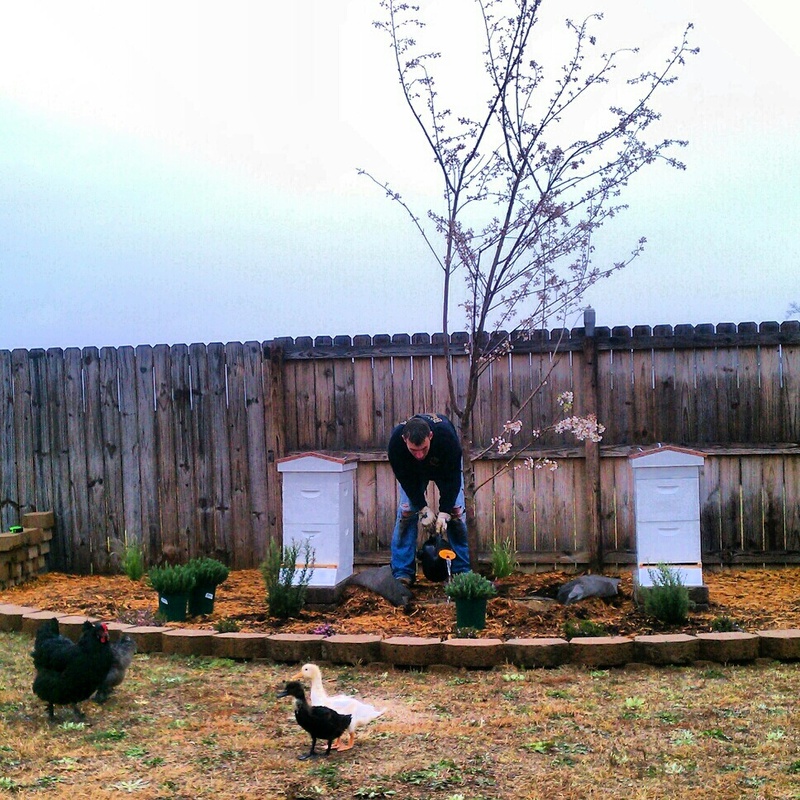 Update Spring 2015: Two years later our little urban apiary is as beautiful as ever! It is everyone’s favorite place to hang out and is the focal point of our yard. 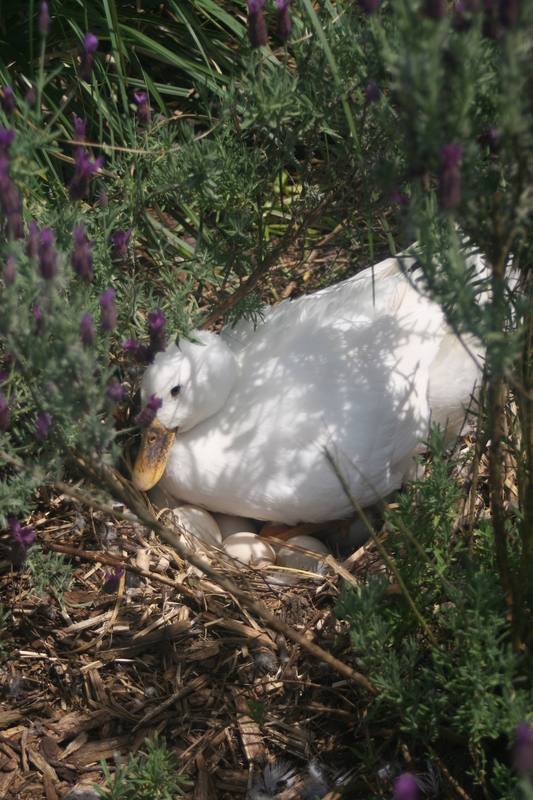 The ducks make their nests and hatch their young among the lavender, the chickens relax under the shade of the tree and the bees bustle about. We often sit on the retaining wall stones watching bees come and go, breathing in the sweet scent of rosemary and lavender. It is just as idyllic and well serving as I had hoped. 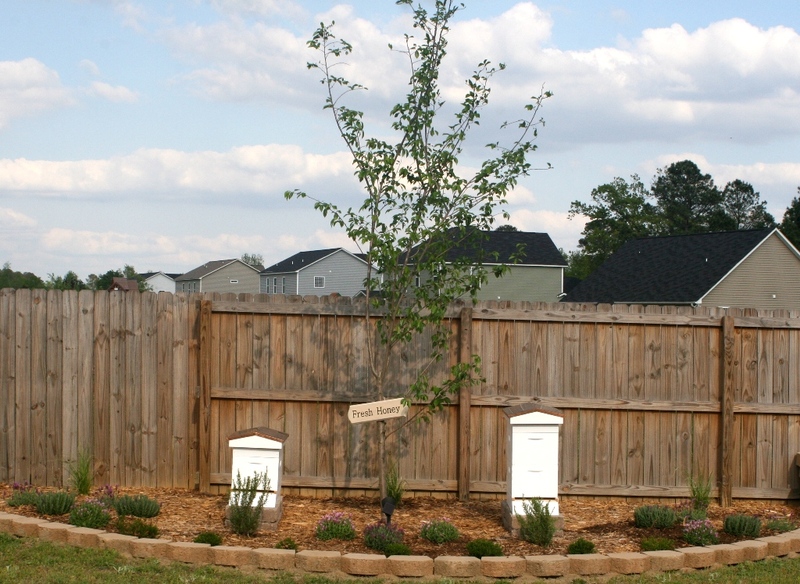 The intent was to landscape a beautiful apiary for our bees so that they would have a functional and welcoming home. What we ended up with lies somewhere between apiary, herb garden and aroma therapy garden. 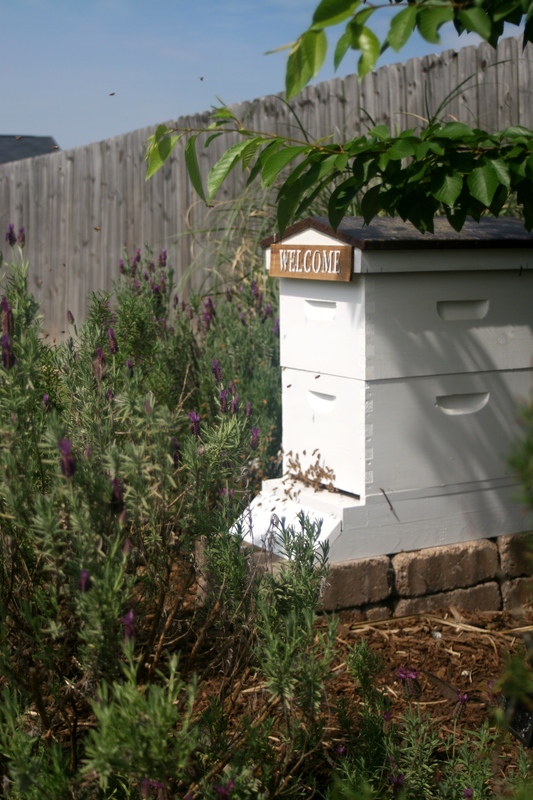 I love when planting is multipurpose – edible, perennial, aesthetically pleasing and good at attracting pollinators – and this apiary is just that. It’s a lovely space for bee and beekeeper alike. 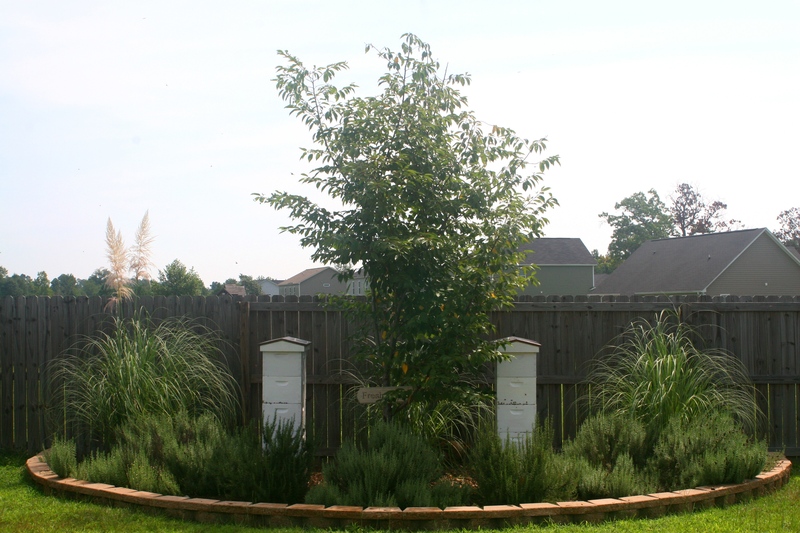 Consider planting in your apiary during early morning on a cool, drizzly spring or fall day. I know these aren’t the gardener’s preferred working conditions, but neither are they the bees’, which means you are far less likely to cause a disturbance. Bees will not venture out of the hive for foraging activities until the outer temperature has risen into the mid 50’s. There may be the occasional security guard that comes out to supervise your activity, but in general, they will remain out of your way and you out of theirs. 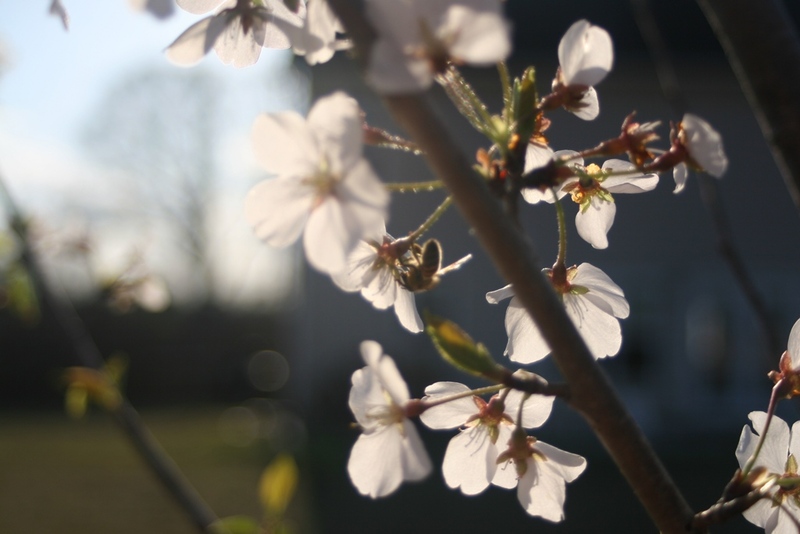 A cherry tree, which is full of heavy blooms in the early spring to feed hungry, over-wintered bees, casts dappled shade to offer some reprieve from the Southern summer heat. 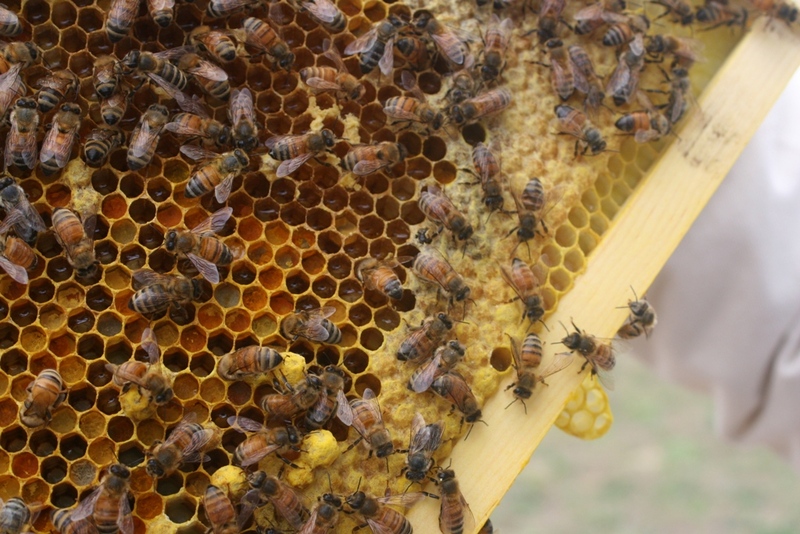 Honey Bees are very particular about the temperature inside the hive, working year round to maintain 94-97°F. When you live in a climate with extreme heat, it may be necessary to help them out by creating some shade – not too much though, they’ll be wanting that sun come the cold winter months. Think of something native to your area that has sparse branching and will lose all of its foliage in the winter months. 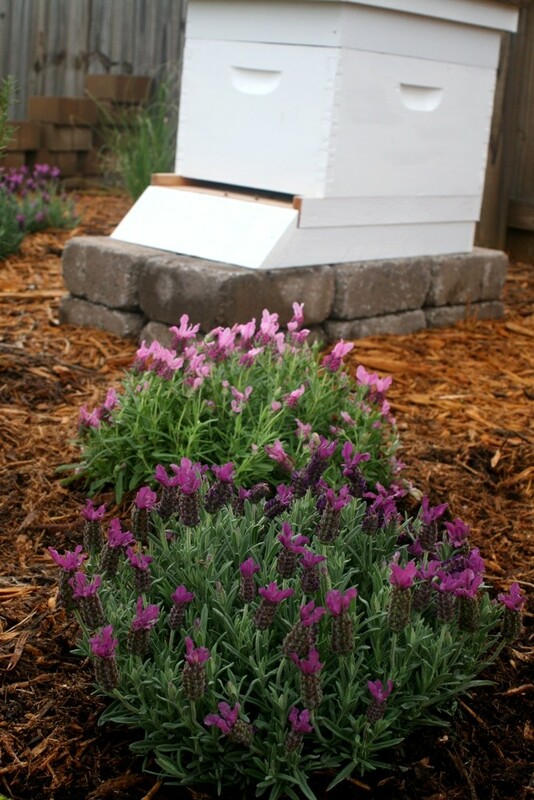 Lavender is a clear choice for apiary landscaping as it’s one of bees’ favorites. 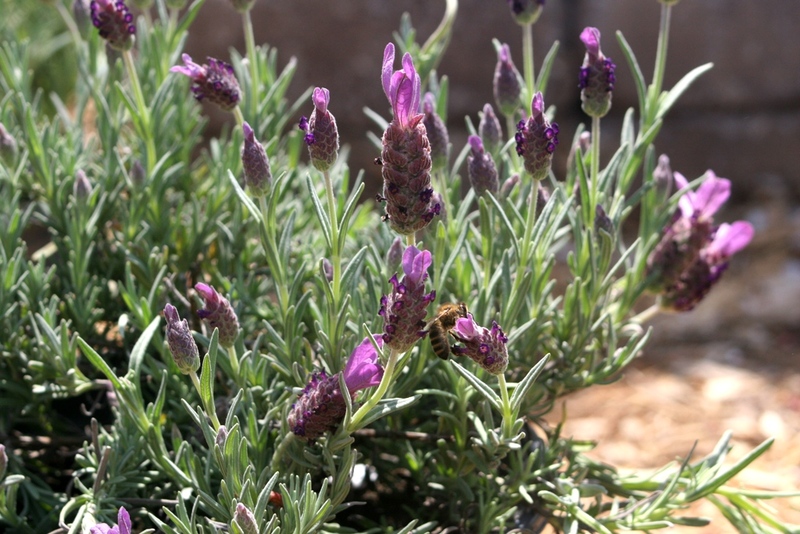 We included various varieties of lavender in different sizes, foliage color and flower color. There are hundreds of lavender cultivars to choose from; we recommend choosing native varieties that will flourish in your growing zone as they will require very little care once established. When planting for pollinators, consider planting in clumps or clusters, rather than a single plant. Not only do they find this more attractive, it makes it more worth their effort. Rosemary is another bee (and chef) favorite. The blue blooms and highly fragrant foliage are calming for both bee and keeper. 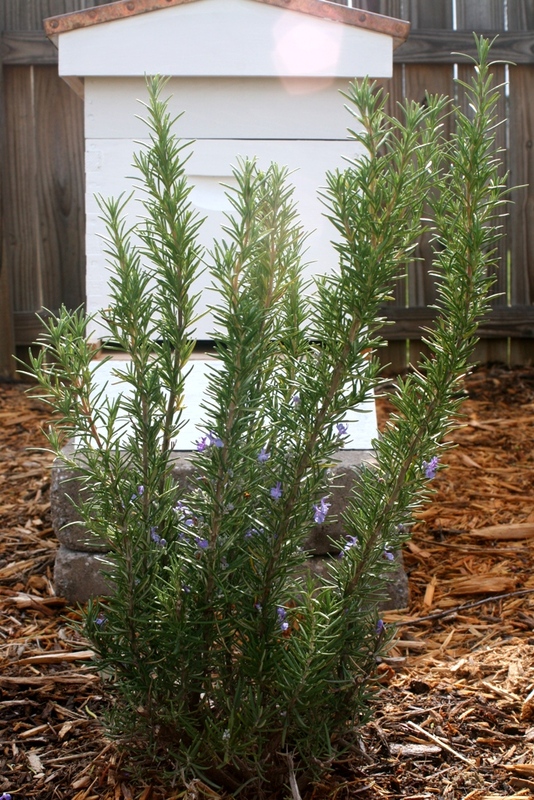 Here, rosemary acts as a slight barrier between the entrance of each hive and the boisterous activity of the backyard. Honey Bees take very serious the job of guarding the hive entrance. By planting a visual and physical barrier you’re helping them keep things around the entrance calm. This barrier should be at least a foot away, giving the bees plenty of space to come and go free of congestion. Heather acts an extremely low maintenance ground cover that produces droves of purple, pink or white flowers from very early spring through late fall. Meanwhile, fast growing Pampas grass will add movement and height as it matures. Remember to leave plenty of space to work in and around the hives. You don’t want to feel claustrophobic when the plants mature to full-size, so plan accordingly. A nicely designed apiary allows for easy foraging (like super healthy, beautiful fast-food for bees) and creates a space for all inhabitants of your urban property to share and enjoy. 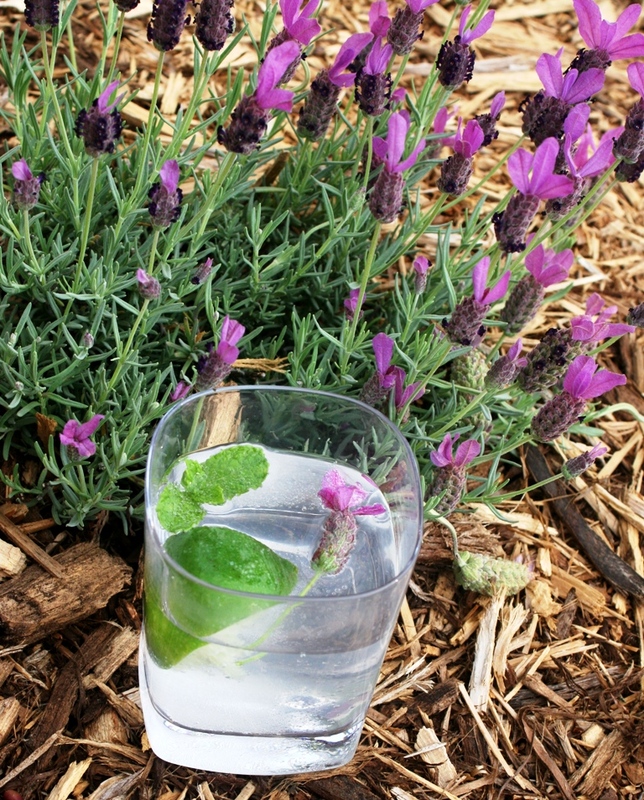 …we can relax with lavender-mint vodka tonic while enjoying the warm evening, aromatic garden, and gentle humming of the hive. Bliss. You see, Peanut ‘n’ Butter did not start out afraid of the water. In fact, they have had quite the love affair with water in their first two months of life. 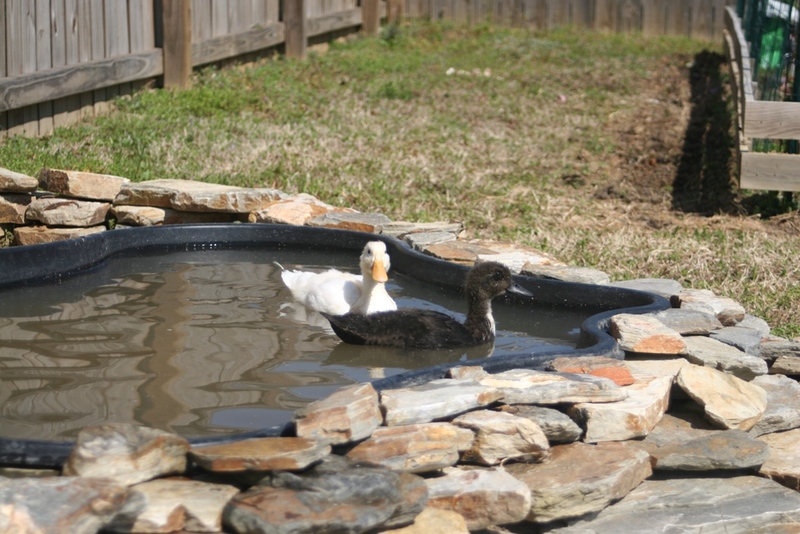 When we moved them outside to be “grown up” ducks, we installed a pond (DIY details to come), which the ducks took to instantly. From the moment there was water in their pond, they did not leave it. 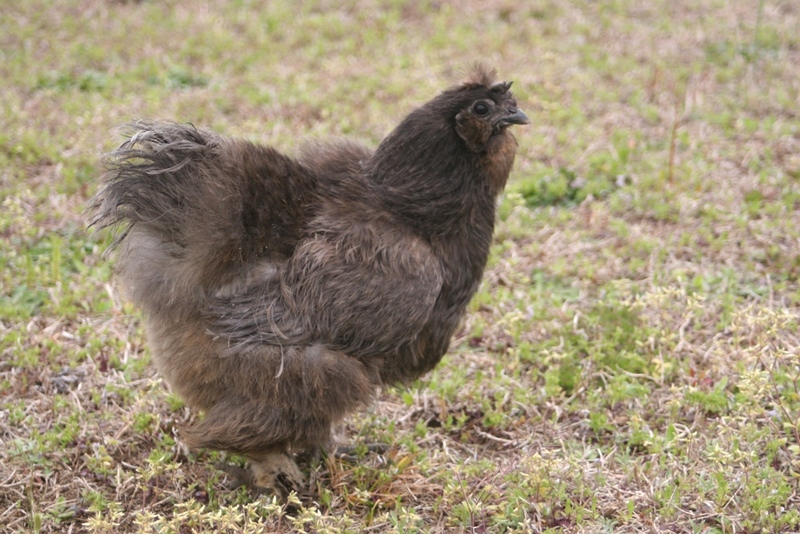 We had to pull them out of it each night to put them to bed in the coop and they immediately returned to it each morning. Then it happened. The Handy Man and I got a good idea and ruined it all. When we see a problem or potential problem in our manufactured habitat, we try to address it in the most natural and mutually beneficial way possible so that it functions somewhat like a realistic ecosystem. For example, with the addition of a pond, we face issues that may arise when dealing with stagnant water – increased mosquito populations. There are a few simple, organic solutions to this: plant mosquito repelling plants (check), install bat houses (check) and introduce fish to the pond. Now, you can see how this seemed like a good idea. Mosquitoes lay their eggs in water. Fish live in water and eat mosquito eggs. Ducks swim in water and eat fish and mosquitoes. 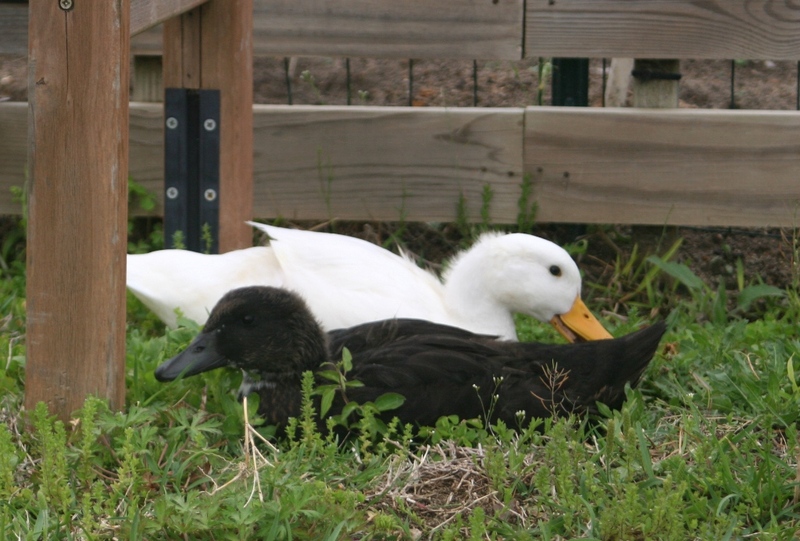 Surviving fish eat duck poop and make more poop for the organic garden. It’s the circle of life. Everyone’s happy. So off to the pet store we went to purchase feeder fish – the tiniest, cheapest fish you can purchase. They’re typically goldfish or minnows that can live in nearly any condition and run around $0.10 a piece. 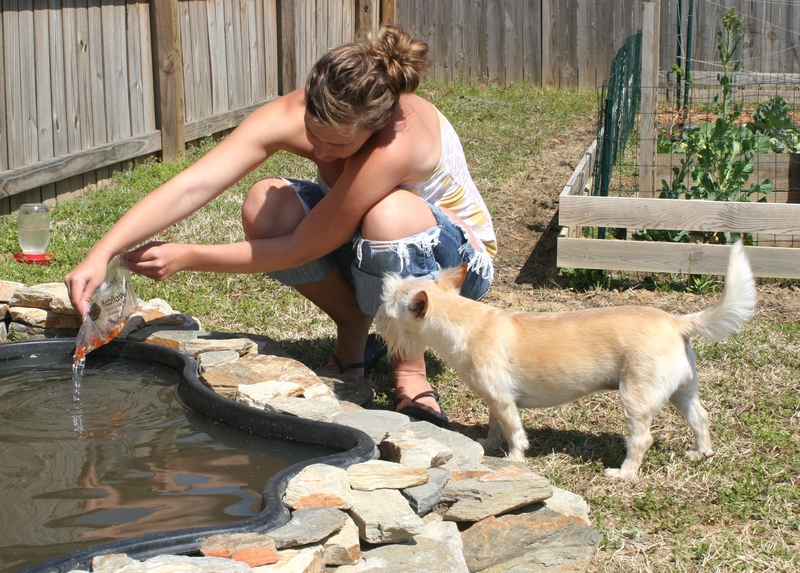 Upon returning home from the pet store, we set the bag of fish in the pond to allow the fish to acclimate to the water temperature. 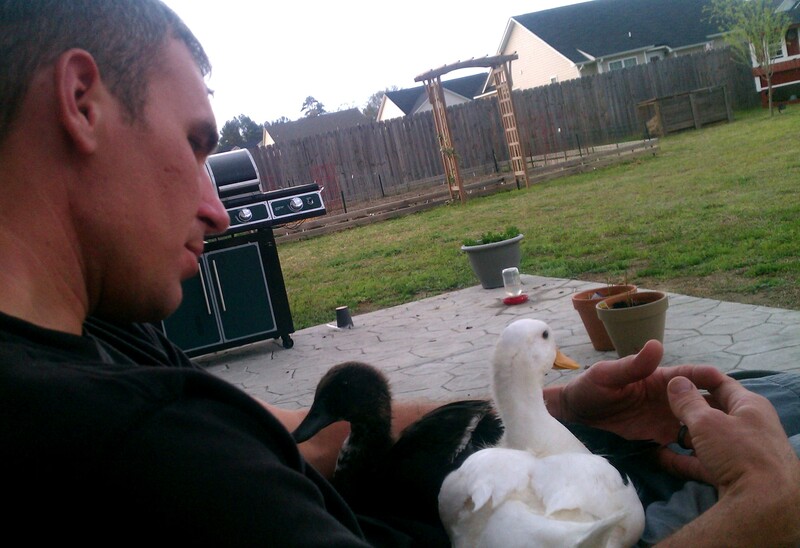 The ducks got out of the pond when we did this but we didn’t think much of it and went about our yard work. After an hour passed, I emptied the fish into the pond and the Handy Man and I sat back awaiting our lavish praise. But no praise came. Nothing came. As far as the ducks were concerned, we had just poisoned their pond and it would never be the same. The ducks were afraid. Of the fish. I looked at them in utter disbelief. “YOU EAT FISH,” I yelled. “Do you not know that yet?” We attempted to heard them to the pond to no avail. They would rather have died than go back in that water. They spent the rest of the day glaring at us from the opposite side of the yard. We hoped that they would go to bed and wake up a.) in a better mood and b.) with no memory of the betrayal. But we had no such luck. The next day Peanut ‘n’ Butter decided that they were chickens, not ducks. They followed the hens around, attempting to scratch up bugs with their webbed feet and did not once even glance longingly towards the pond. It was dead to them. Everyone in this picture, including the dog, thinks that they’re a chicken. 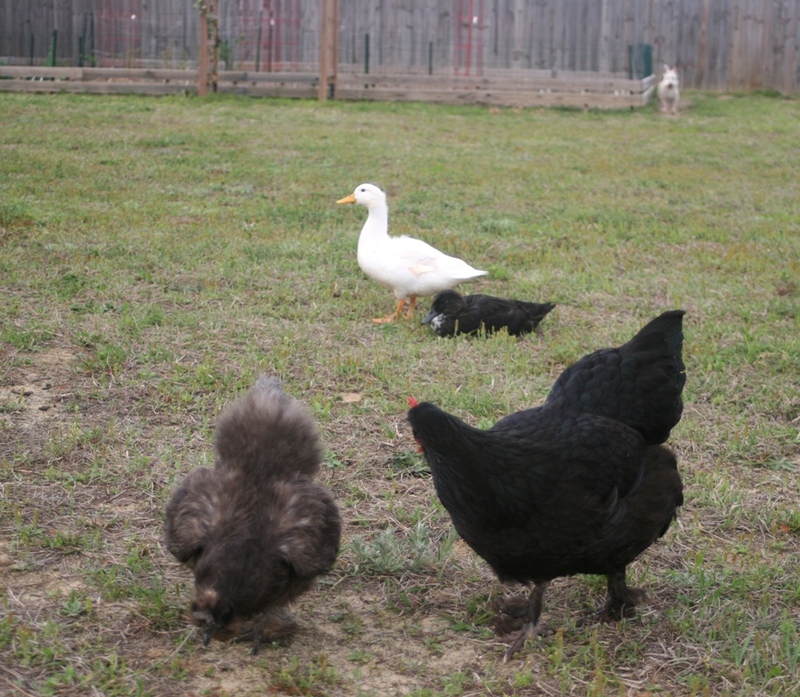 The chickens, now sensing an imbalance in the backyard hierarchy, decided that they would try out being ducks. As you can imagine, this did not work out very well. Mid-day I found Uggh unsuccessfully “swimming” in the pond, half chasing fish and half panic-stricken, trying to get out. I scooped her up and dried her off. Hopefully she has realized that although a duck may get away with acting like a chicken, a chicken cannot get away with pretending to be a duck. Silly Uggh, you’re not a duck. Day three was more of the same. Impatient with their lack of progress and understanding of their own nature, we tossed them in the pond, thinking it would jolt their instinctual memories. But no. They just jumped out, ran away and glared at us from a safe distance. We tried to lure them closer by placing their food and water dish near the pond’s edge, but they refused to eat from it. Instead, they ate weeds from the yard until we moved the food further away from the water’s edge. We’ll just eat these weeds instead. Exasperated at the end of the day, we sat with them that evening, trying to rebuild the trust lost in our relationship. They noisily chatter away, expressing their deep dissatisfaction with the situation to the Handy Man. Of course, as the fish-dumper, I can no longer be held in such confidence. Today we got the idea to play the ducks Youtube videos of other ducks splashing and playing in the water, hoping that the excited sounds of their brethren would entice them. (The things you will do for your emotionally distraught ducklings!) We did this for over an hour as Peanut ‘n’ Butter cocked their heads back and forth in response to the familiar noises to no avail. Although they did express interest and crept closer, they never breached the barrier at which they considered a safe distance away from the poisoned pond and monstrous fish. We’ll be over here…as far away from the pond as possible. The fish are happy, though. They’re flourishing and have at least tripled in size. Scary little suckers. I guess the circle of life isn’t always so straight forward. Who knew? In the world of all things edible, perennials are worth their weight in gold! 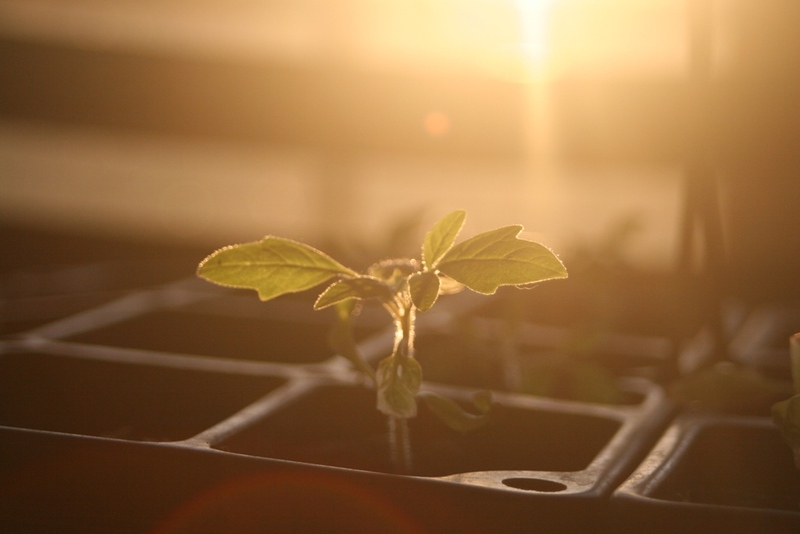 They require a little more planning up front, such as additional soil amendments and thoughtful placement, but are some of the most rewarding and easily cared for producers in your garden. 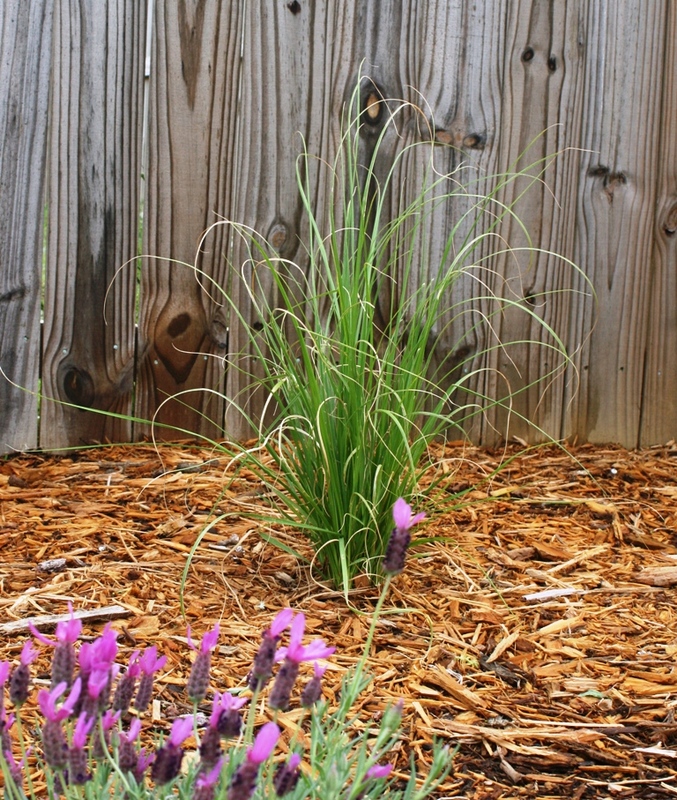 They also make for beautiful landscape additions, leaving you more workable garden space. Although I can often be found ignoring planting zones all together (the dead Mango tree in the compost bin will attest to that), it is important when considering some perennials and may impact variety selection. Pick a variety hardy in your zone to insure success. We linger somewhere between USDA zone 7b and 8a; these are our favorite, most productive perennials. I could write sonnets about my love of Asparagus. 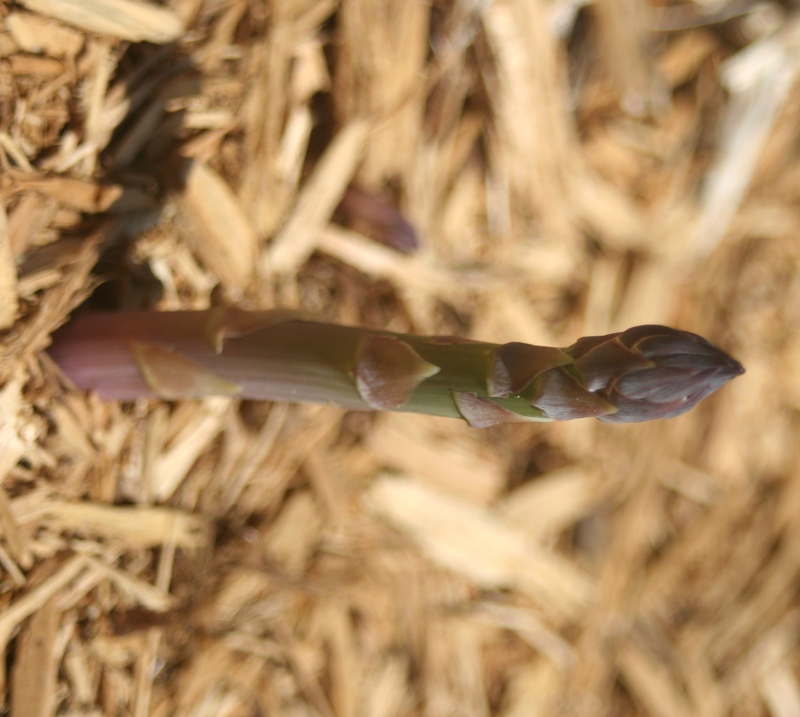 They are the first thing to come on in early spring; while you’re still day dreaming of putting your started plants in the dirt, asparagus’ first steams are already reaching for the sky. It produces heavily for several months before bushing out into a beautiful fern that will shade out most weeds – which means even less work for you! Once established, they are also extremely drought tolerant and are very hardy in hot and cold temperatures. 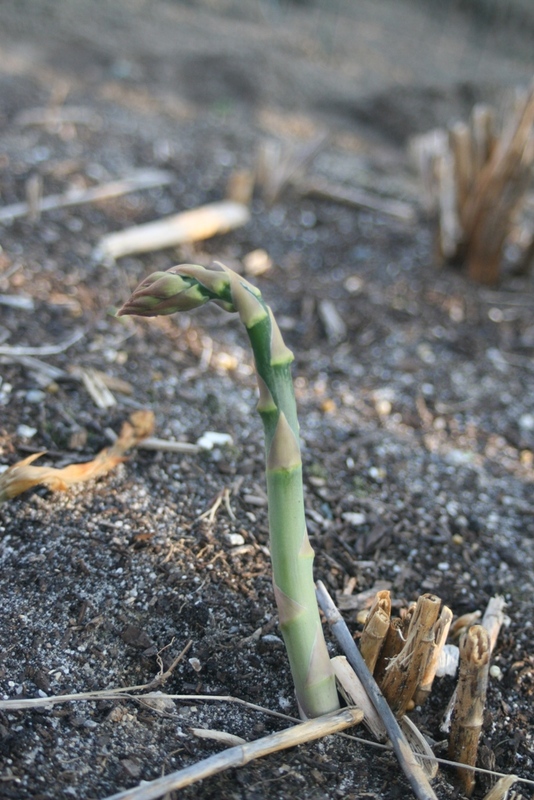 If cared for properly, an asparagus root can be productive for over 15 years. Growing up, my grandma had roots in her garden that were nearly 30 years old and still producing year after year. This earns asparagus the number one must-have perennial spot. Fresh herbs make all the difference in cooking, but are so expensive at the grocery store or farmer’s market! It may surprise you to learn how easy they are to grow at home as perennials. Rosemary, Thyme, Oregano, Mint, Sage and Lavender are all hardy perennials in most growing zones. In zone 8a/7b, where I live, Parsley also grows as a perennial with no extra effort, while dill and cilantro self-seed each year. Herbs do well with confinement to a pot (indoors or out), and are beautiful edible additions to traditional landscaping. The sheer fact that they will pay for themselves a thousand times over earns them the number two spot. However, their evergreen beauty through the winter months, ability to attract pollinators, ease of care and capacity for improving the flavor profile of everything in your kitchen could nudge them into first place if you’re not as obsessed with asparagus as I am. These will make you a master chef. 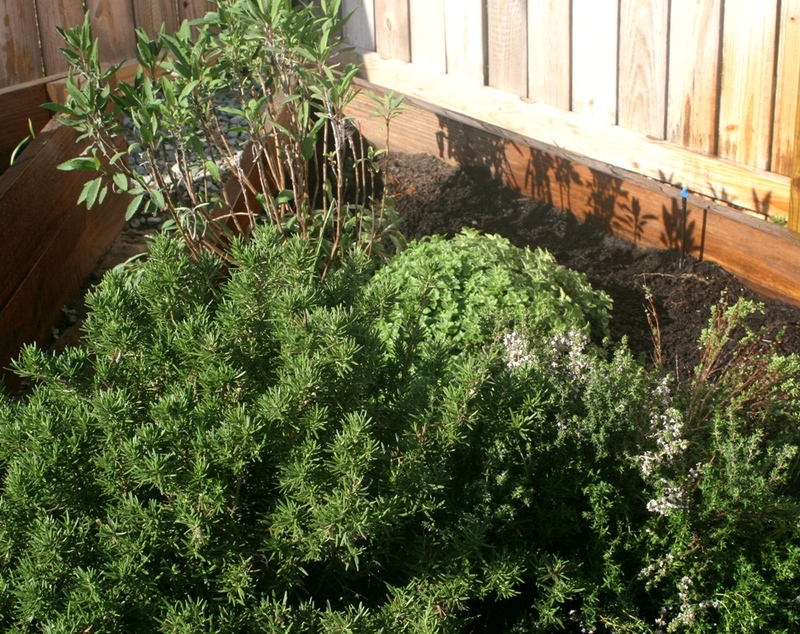 Clockwise from the top: Sage, Oregano Thyme and Rosemary. Blueberries, Raspberries, Strawberries, Cranberries, Goji berries – all berries! Berries are expensive to buy and often soaked in a chemical soup of pesticides. 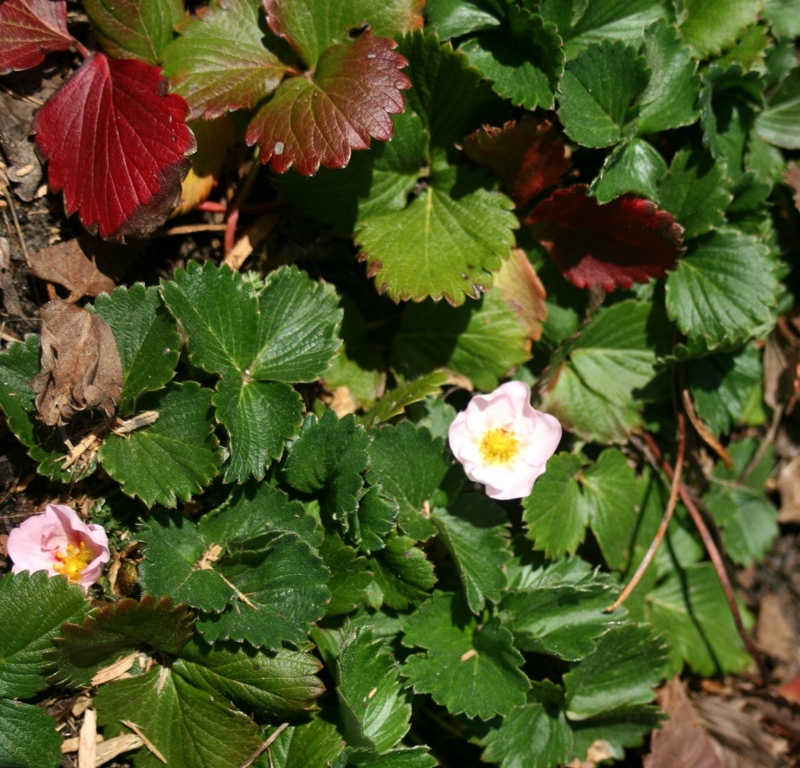 You can find cultivars of most kinds of berries well suited for almost any growing zone. Although they often take a couple years to start producing heavy yields, I promise they will be worth the wait. Most berries require a little pruning to keep plants healthy and yields high, but it is very little maintenance when you consider how many non-fruit yielding trees and bushes you extend the same effort to each fall. I was gifted a few precious heirloom walking onion bulblets, and now have an entire bed full! It was certainly one of the best gifts ever. 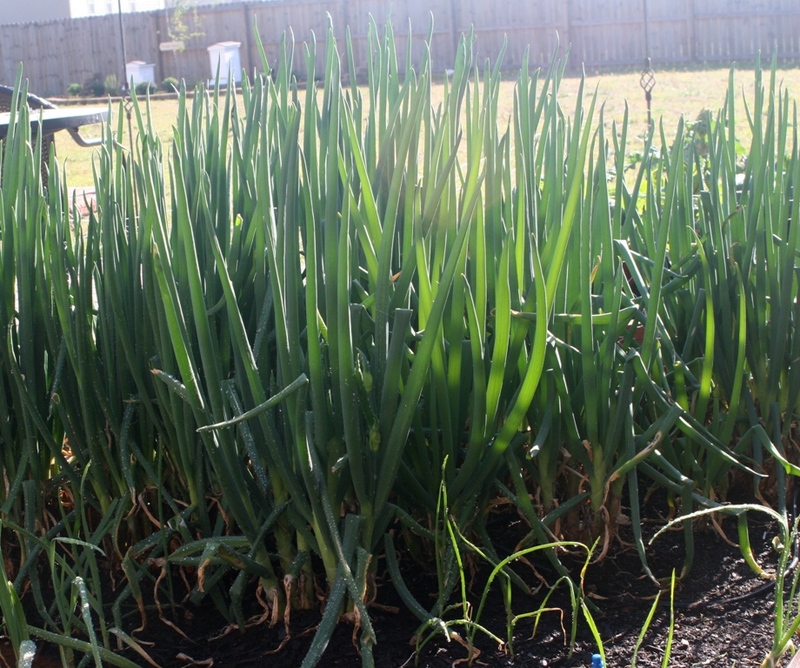 When these onions grow, they look much like green onions or scallions. You can trim the tops off and directly substitute them in any application you would use green onions. You may use the large underground bulb onion that forms at the base and also the small pearl like onions that form at the tip in place of a flower. The plant “walks” itself by sprouting bulblets on the original stalk, which then bends under the weight, setting the small onion bulb “seeds” down, allowing them to root near the parent plant. If you allow the bed to become well established (ie., don’t over harvest the first year, and allow the onion to “walk”), you will never run out of onions. That’s right – forever with onions. It’s a glorious thing. Pies. Does this need further explanation? Rhubarb is extremely difficult to find in the market here. I was told by a local gardener that Rhubarb simply does not grow well in this climate – this is where ignoring growing zones can occasionally come in handy. 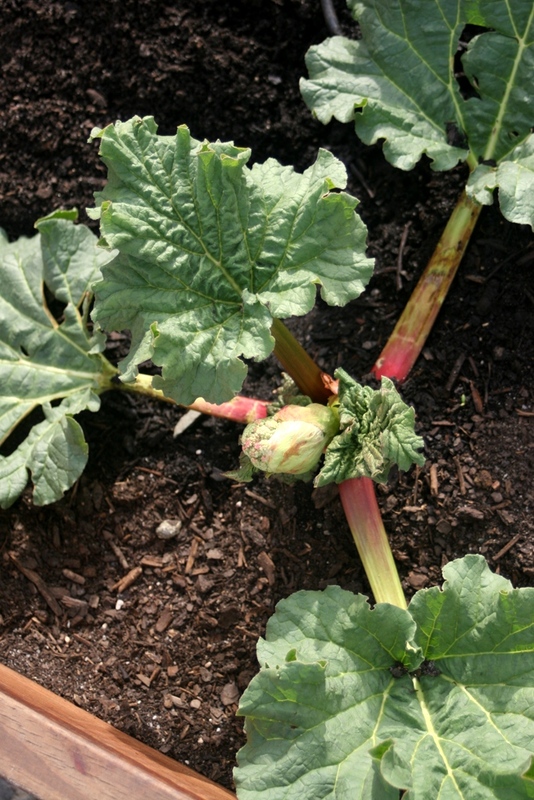 I was determined to grow rhubarb; committed, against all odds, to force it to grow and get my pie. As it turned out, it was beyond simple and took no extra effort short of picking up a rhubarb crown from the farm and garden shop. I planted it, and it grew. It really is just that simple… Go figure. Rhubarb dies completely back in the late fall and returns in early spring with bright red steams and huge beautiful leaves, gracing the barren garden with color. And then you harvest the leafstalks a few at a time, compost the leaves and make it into pie. Be sure to keep little hands, mouths and beaks away from the leaves of the plant as they contain oxalic acid, which is considered toxic. Also be careful to not over harvest the first two years as it establishes itself. Never take more than half of the plant’s leafstalks away in any given harvest, so that the plant will have enough foliage to sustain itself. 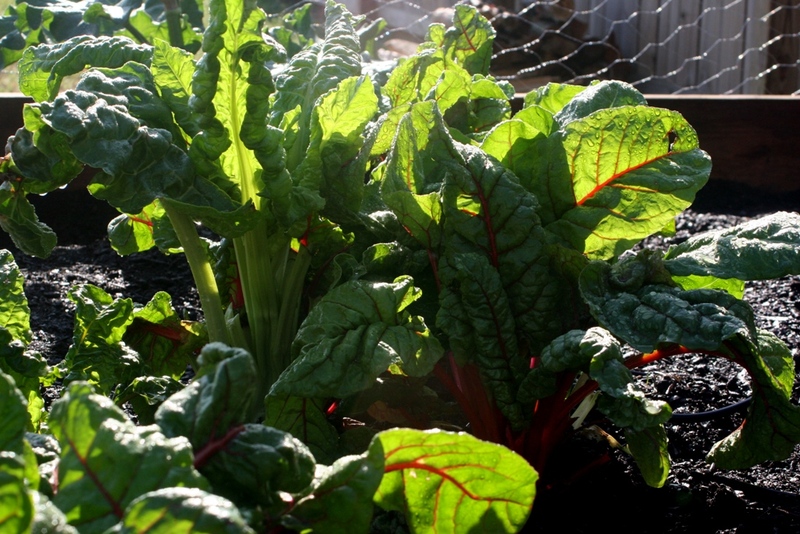 Now, I know that Swiss Chard and Kale are not technically perennials, but did you know they can often behave like one? I have two year old swiss chard and kale plants that will not stop growing. And if they want to grow year round, who am I to stop them? Their preferred growing seasons are fall, winter and early spring, during which will be the best time to sow your seeds. However, they are very hardy plants that often times survive the summer heat. Growth will be minimal during the summer months and I would discourage harvesting during this time to avoid stressing the plant. Production will pick right back up when the temperature becomes a little more bearable. To keep up growth as a perennial, it is important to make sure the plant is not depleting the soil of vital nutrients. You can do this by amending the soil with compost annually or biannually, watering with compost tea every couple of months, or adding other organic fertilizers. Thanks for breakfast today, Chard! So there you have it – our favorite perennial fruits and veggies. What is at the top of your must-have edible perennial list? Mornings on the farm are so peaceful and so full of wonder. Today we planted the spring garden! 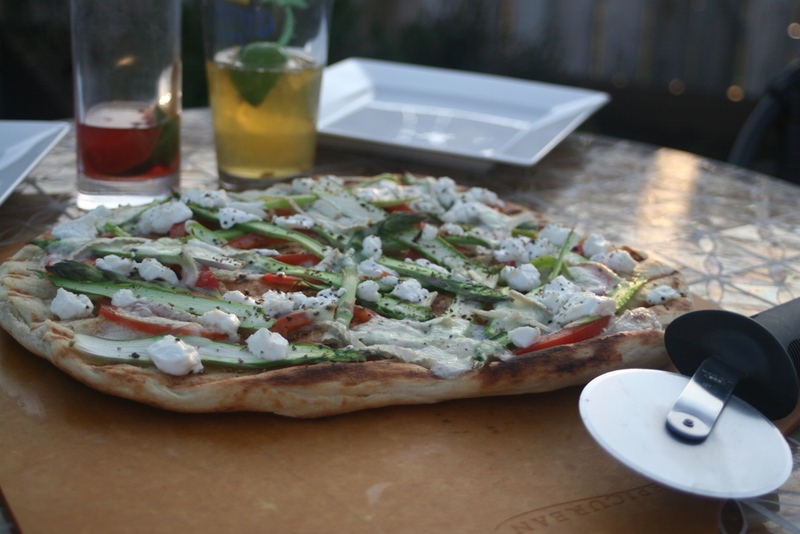 After all of that hard work, all we really want is to kick back with a beer and some pizza… grilled asparagus pizza to be exact. 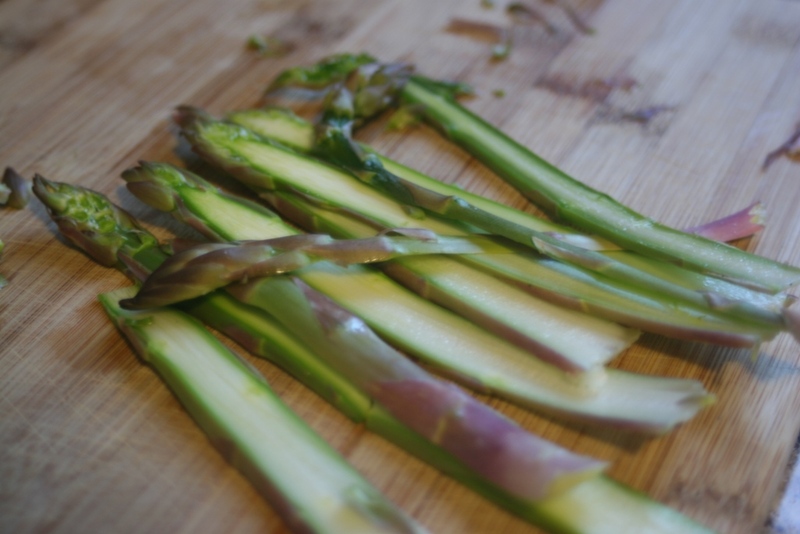 This is a perfect meal for early spring, when your asparagus is just starting to come on and producing somewhat sporadically, as you will only need a few good sized spears. 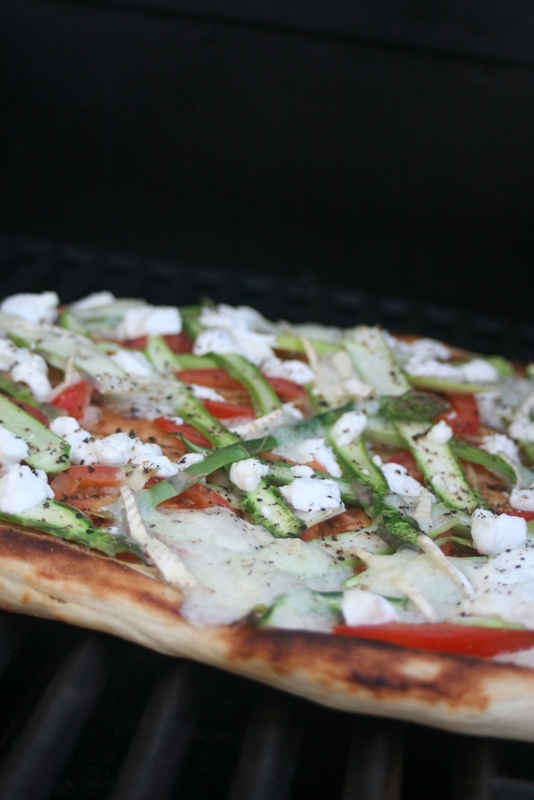 If you have never grilled pizza, you must. If you trust nothing else, trust this. Grilled pizza is the very best kind of pizza. It may forever change your outlook on all pizzas everywhere. On to the grill you go! There is no sauce on this pizza. I know, I know – is that possible?! Yes! Give it a try. This is the kind of pizza that requires very few, high quality, fresh ingredients. 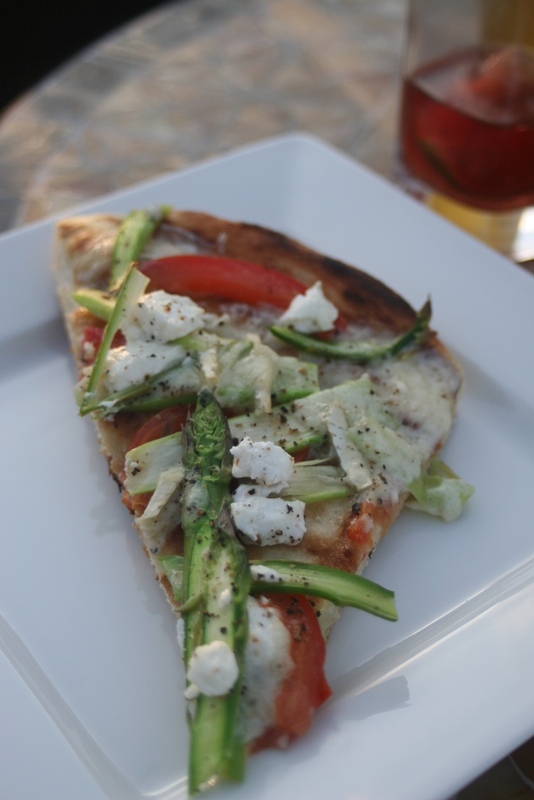 It is light and lovely and everything a spring pizza should be. Occasionally we mix it up with a light pesto sauce, when the basil is in, or even a béchamel sauce… but pure, unadulterated, sauce-less is my favorite. The combination of hot, juicy tomatoes and olive oil work to create a rustic sauce-like effect that is simply perfection. Preheat grill to 375 degrees Fahrenheit. Poor approximately ¼ cup olive oil onto a baking sheet; place the dough in the center and gently spread out into desired size, working from the inside outward to get an even surface. Keep in mind the size and shape of your grilling surface. Transfer dough to grill, oil side down. 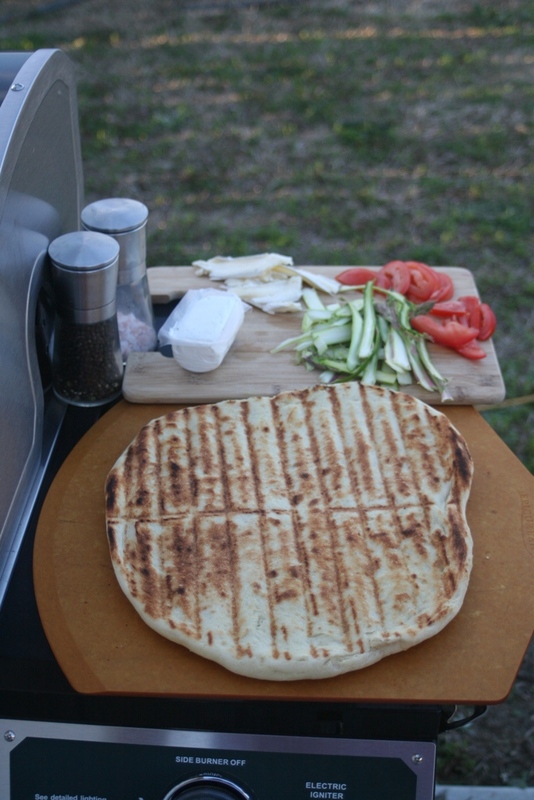 Shut grill lid and cook for approximately 8 minutes, until dough on bottom has distinct grill lines and is golden brown. Remove dough from grill, and lightly oil uncooked surface. 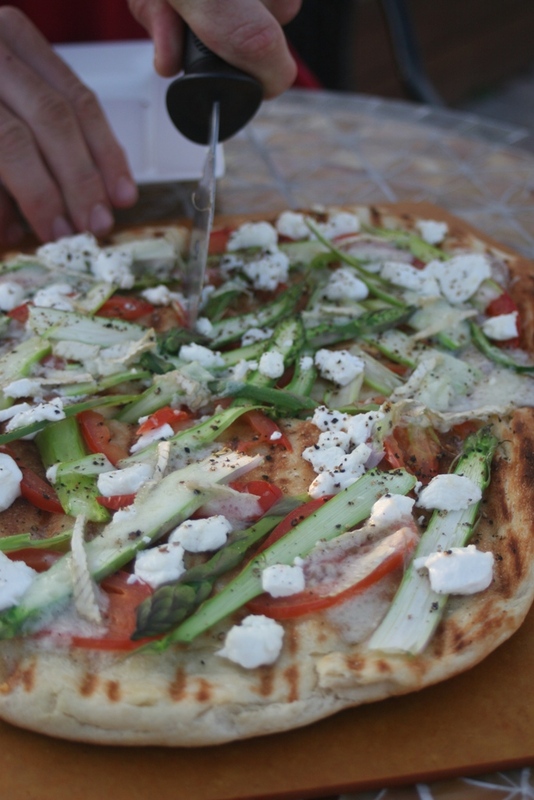 Flip the newly oiled side down onto work surface and brush grilled side with olive oil then dress the top with tomatoes, asparagus ribbons, cheese and season with salt and pepper. 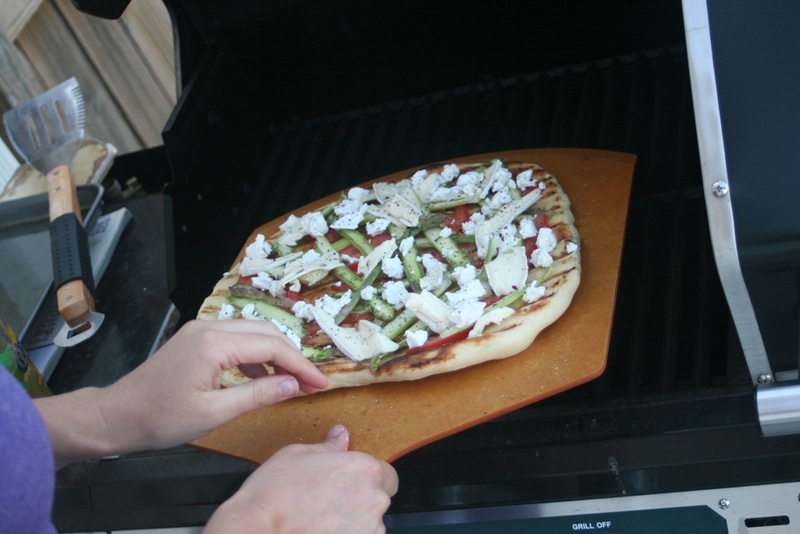 Transfer back to grill, shut the lid and allow pizza to continue to cook for approximately 10 more minutes on 350 degrees, until cheese is melted and dough is cooked through. In stand mixer bowl, fitted with dough hook, combine water, honey and yeast. Let sit 5 minutes until yeast is visibly active. Then, add salt, olive oil, garlic, herbs and flour. Mix on low until combine; dough should be slightly tacky. At this point, turn the mixer to high for 6 minutes to knead the dough. This is the most important step for perfect pizza crust. Six minutes. No more, no less. Then, form dough into a ball and gently oil surface, so it doesn’t dry out while rising. Cover and let dough rise for approximately 2 hours until it doubles in size.